The first half of 2017 required a few decisions to be made and we spent a bit like drunken sailors to make them. Average monthly spending was £2,404 which is well up on 2016’s £2,250 average. When I look at the detail the story is all holiday/relocation research where we had a monthly average spend of £544. At least we were able to decide on Cyprus over Spain although I freely admit there is only a cigarette paper between them and this could change in the coming months. We also decided I’d push on with work a little longer while Brexit played out a little more. As the dust has settled on that decision we’re all a little uneasy about it. One of the whole points of this FIRE lark was about control of our lives which includes the ability to do what we want where we want to do it and here we are letting government incompetence rule our decisions. More on this in future posts I’m sure. Financially, it’s actually been reasonably successful with wealth up £107,000 in the first half of 2017. I say reasonably because while that looks pretty good it’s in a currency that less and less people seem to be wanting post the Brexit vote. 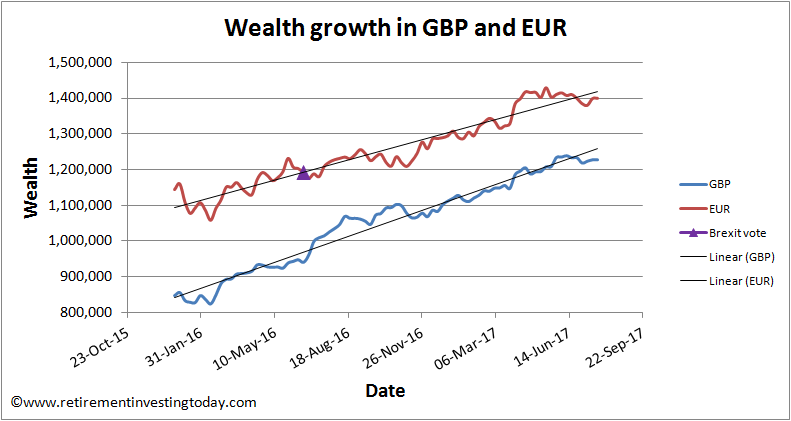 Measured in the currency that is important to us that wealth growth falls to EUR92,000. Still admirable I think. Let’s look at the detail. 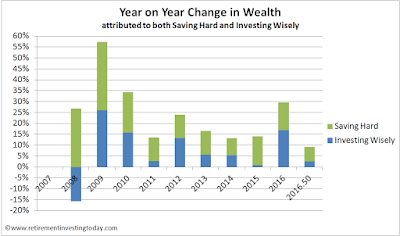 I continue to define Saving Hard differently than most personal finance bloggers. For me it’s Gross Earnings (ie before taxes, a crucial difference) plus Employer Pension Contributions minus Spending minus Taxes. Earn more and one is winning. Spend less or pay less taxes and you’re also winning. 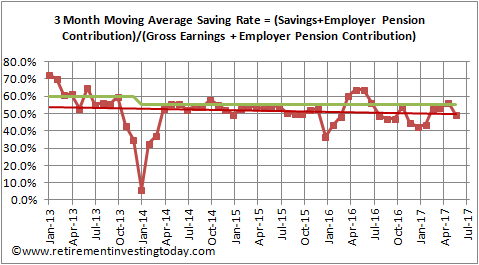 Savings Rate is then Saving Hard divided by Gross Earnings plus Employee Pension Contributions. To make it a little more conservative Taxes include any taxes on investments but Earnings include no investment returns. This encourages me to continually look for the most tax efficient investment methods. Even with the overspends highlighted above my savings rate for the quarter was still 49.5% against a plan of 55%. In monetary terms that’s just under £75,000 saved in the first half of 2017. Saving Hard score: Conceded Pass. Back below plan after a good first quarter but I’m ok with it because the overspending was conscious, was impactful to us and is importantly not baked into our forward spending. Savings also added 6.7% to my wealth in half a year which is also not to be sniffed at. Investment return for Half 1 2017 (07 January 17 to 08 July 17) was a modest 2.5%. Total wealth is now £1,226,129. I’m sure there will be plenty of bloggers out there who have beaten that return. That said I’m not unhappy with it. 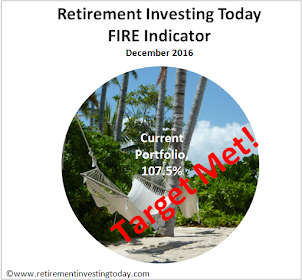 My investing strategy continues largely in line with that developed at the start of my DIY journey except for 3 tweaks that are now necessary given my relative closeness to FIRE. We actually viewed this home and we could very easily live happily ever after there. Working a little longer than Financial Independence Day is certainly allowing us to increase our home budget somewhat which is then giving us more options. After purchase costs my remaining cash would then be EUR85,000. The second is to ‘ensure’ I can live off dividends alone in FIRE. This has required me to increase total wealth, less cash, dividends to 3% with that number coming from a decision to drawdown at 2.5% after expenses. This then leaves a little for reinvestment to ‘safeguard’ the living off dividends idea. Today I’m right on that 3% number. In monetary terms in the first half I’ve pulled in £16,783 worth of dividends meaning the year should be at least £26,180, which is EUR29,401 if I convert it at the worst Euro exchange rate since its inception. In addition to upping the home budget working a little longer has also enabled me to increase our annual spending budget. Today that’s set at EUR27,800 which after all fixed costs (including a new car every 10 years and home repairs assumed at 1%) now leaves 47% of the budget available to ‘fun activities’. 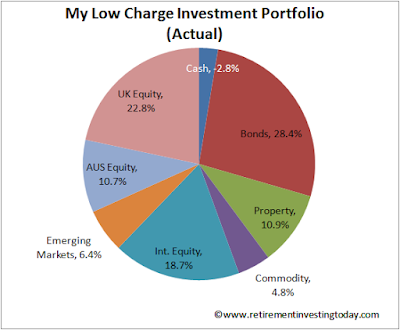 Whether we use all that is another question and if we don’t it will just reduce our drawdown risk. Importantly also, that leftover EUR85,000 from the home is now 3.1 years of spending so cash holdings are exactly where we need them to be. As far as dividend cover (dividends divided by planned spending) is concerned it’s now 1.06 so this is the area to work in the coming months. I’d ideally like to get it to 1.2 or so. The third is my new tweak which is to start working towards my Early Retirement Financial Strategy . This is what my asset allocation looks like today. I’m still a little underweight bonds/international equities/gold and a little overweight property, emerging market equities and UK/Australia equities but to be honest it’s all now pretty close to where I want to be. I’d certainly go into Early Retirement (ER) looking like that. 11.9% held within a TD Trading ISA. Tax efficiency score: Conceeded Pass. At the end of 2016 this was 65.8% and it’s now 64.6%. At this stage of my journey I don’t want to add any more to my pension as any more contributions after tapering and carry forward would see me exceeding my annual pension allowance. Additionally, even if I can access my private pension at 55 there is now starting to become a risk that I’ll exceed the Lifetime Allowance (LTA). NS&I Index Linked Savings Certificates (ILSC’s) are no longer on sale so no options there. I do have a little ISA allowance remaining for the year and I will be sure to fill that before year end. Otherwise I’m really out of options. Investment expenses also continue to be treated like the enemy and are today 0.22%. At the end of 2016 they were 0.25% so this is a nice improvement. Minimise expenses score: Pass. 0.03% doesn’t sound like much but for me it’s now the equivalent of £368 every year. Certainly better in my pocket than that of a financial services corporation.. In the scheme of a lifetime of investing this half is insignificant. I’m all about time in the market and not timing the market so let’s zoom out and look at my performance since I started down this DIY road. 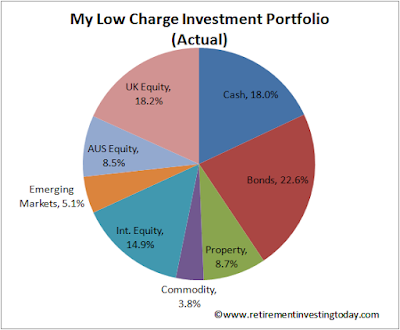 I’m happy with my long run nominal of 6.8% which is a real (using RPI) return of 4.0%. The chart below tells the story. 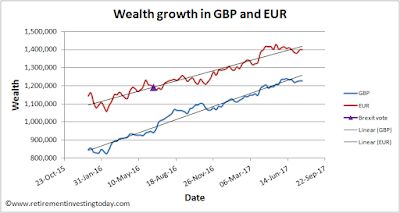 Note that the chart assumes a starting sum of £10,000 which was not my portfolio balance at that time but is instead simply a nominal chosen sum to demonstrate performance. 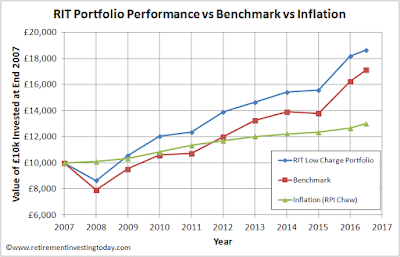 Since the end of 2007 the benchmark continues to beat inflation with Inflation growing at a Compound Annual Growth Rate (CAGR) of 2.8% compared with the benchmark at 5.8%. 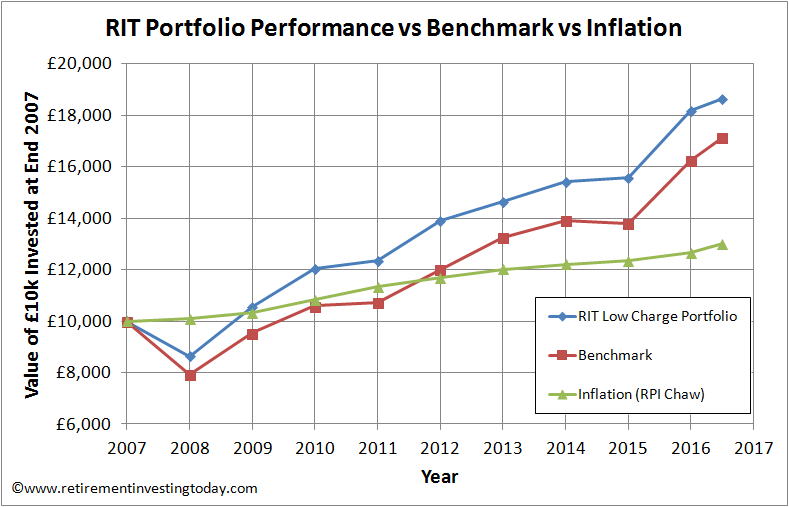 In contrast my portfolio has increased at a CAGR of 6.8%. In real inflation adjusted terms that’s therefore now 4.0%. 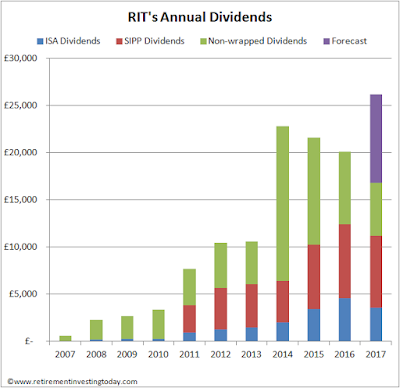 My whole investment strategy since 2007 has been to generate a long term Real Return of 4% and throughout my journey I’ve always been well behind but it seems it might not have been a fetched target after all. Long term investment return score: Pass. Right on plan but is this bull market close to becoming a bear. 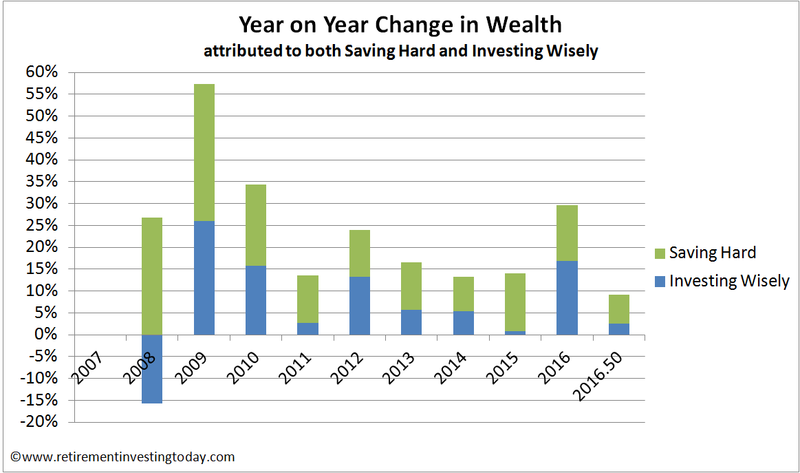 Combined Saving Hard and Investing Wisely should eventually give Early Financial Independence and the option of Retiring Early. 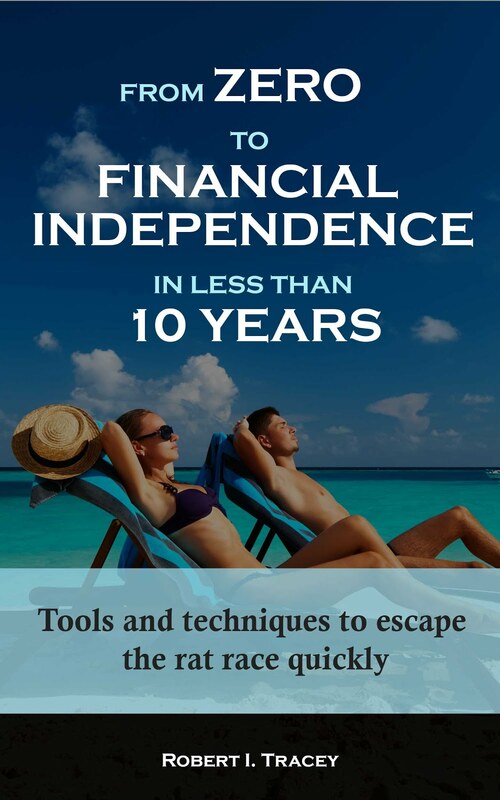 I’m already Financially Independent – that took me 8.7 years. The question now is when to Retire Early. I’m 9.7 years into that journey and I’m indicating one more year’ish. I currently have a problem with that year and I’m more thinking ‘ish as I type this. Retiring early score: Conceded Pass. 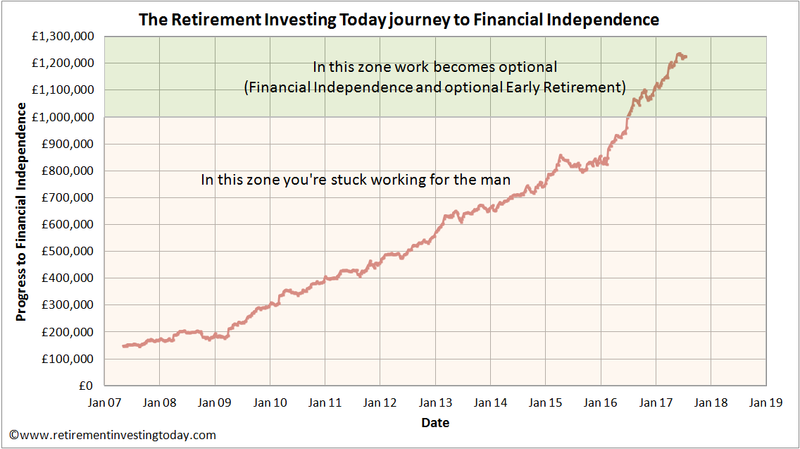 Financially I’m there with retirement possible as early as age 43. Now I just need the emotional courage to pull the FIRE pin. How has the first half of 2017 been for you?
" Gross Earnings ... plus Employee Pension Contributions": do you mean Employer Pension Contributions? The distribution of equities looks odd for someone who plans to retire to the eurozone and who presumably expects it to thrive while Britain doesn't. UK 22.8%. Aus 10.7%, Intnl 18.7%. Are your bonds mainly in the eurozone? In your Cyprus shoes I think I'd want (i) a heap of Euro cash, but perhaps not held in Cyprus, (ii) ILSCs as (nearly) all my GBP cash-like, (iii) I suppose Euro bonds, and/or maybe hold US TIPS euro-hedged - does anyone offer a fund or ETF that does that? (iv) a diversified equity portfolio, (v) some gold and silver. No doubt there would also be miscellaneous bits-and-bobs. 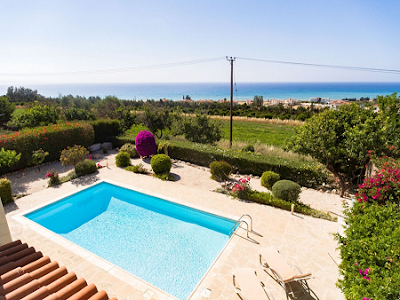 Are you planning a big reallocation when you become tax-resident in Cyprus? If it's not clear: I'd cling like mad to my ILSCs as the key investment in case I found that I wanted to return to the UK. I'd rather sell equities that I can always replace, than ILSCs that I can't. - then because of the Aus learnings didn't reposition for Europe retirement just in case. 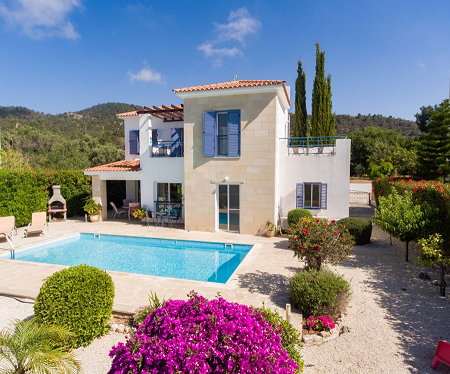 My plan from here is to get to the Mediterranean and make sure it's home THEN start to reposition the portfolio as a European. Good point about the ILSC's. They'll likely be one of the last things that I'll sell (extinguish all cash first) which in reality would only happen if we entered a bad equities bear market as we were settling our home purchase or during the first few years post purchase (dividends fall heavily). Otherwise I'll be selling down a few of those Aus Equities/Bonds (no CGT in Cyprus on these) to fund the home purchase while rebalancing my portfolio (still treating ILSC's as a bond). As an early retiree who lives in Europe (admitedly one of the more expensive locations - Austria), I would be interested in the breakdown of your €27,800 in expenses. I guess Cyprus is at the cheaper end of the scale but not sure about the cost of schooling, medical etc. The 1% home maintenance (c€270 a year?) looks very light. When I became FI I broke down my planned expenses in quite a bit of detail. 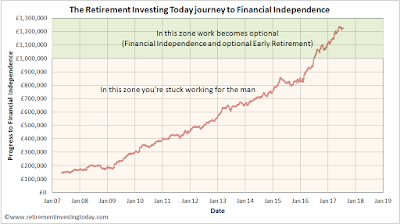 It's the third hyperlink (Financial Independence Day) under the Invest Wisely heading above. Since then I've tweaked it based on in country learnings but the real increases are really only in the 'fun' category. The 1% is 1% of the home purchase price which in my plans is EUR2,750 per annum at this time. Once I'm in country and actually spending I'll be sure to share real expenses. €2,750 makes a lot more sense. Have you thought about the kids (school and ultimately uni)? 1. Our friends in France find the maintenance effort on their swimming pool enormous and wish they'd never built it. 2. For someone retiring in the Eurozone, why aren't you investing in Europe? It would at least reduce your exposure to currency swings? It gets pretty hot in Cyprus, or Spain for that matter. It would be pretty unbearable living out there without a pool. I'd factor it in as a mandatory requirement rather than a frivolous luxury. How are the foreign language classes going? Or is that part of your additional research budget? Ooh - Tarifa would be nice. That Mistral wind is a windsurfers dream. You could live on the Rock and effectively not have to emigrate? Consider retiring in East Europe! Noticed some great opportunities around! Cyprus seems a bit expensive as a tourist zone! Yeah, Crimea for the cool cats. -2.7% return for the clans' holdings over first 6m of 2017. This reflects the perils of being priced into holding two thirds of the potfolio in overseas denominated shares (currency closely tied to USD). To sell now would trigger a large capital gains liability. The "UK" third returned 5.1pc. I also did a partial SIPP transfer to reduce platform fees 20bps. Made a mistake trying to time market while doing SIPP transfer though and was out of market and in cash for about a month. Who is the free man....the poor man who believes he is free or the rich man who believes he is not? That's a Phil original and one we both need to consider as we push out our end dates.